Be the first to share your favorite memory, photo or story of Clifton. This memorial page is dedicated for family, friends and future generations to celebrate the life of their loved one. 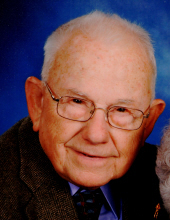 Clifton Orval Keplinger, 93, of Bridgewater, passed away Sunday, November 18, 2018 at his home. He was born in Maysville, WV on May 20, 1925, and was a son of the late Jacob Garland and Edith Mary Susan (Schartiger) Keplinger. He was united in marriage on October 5, 1946 to Valley May (Swartz) Keplinger, who preceded him in death on March 21, 2018. Julie Huffman, all of Harrisonburg; son, Kevin Keplinger and wife Penny, of Bridgewater; a sister, Eilene Meyerhoeffer, of Mt. Crawford. He is also survived by six grandchildren, six great-grandchildren and one great great granddaughter. He was preceded in death by his grandson, Aaron Keplinger, two sisters, Arvella Cleaver and Viola Mongold, and four brothers, Cletus Keplinger, Garland Keplinger, Lyle Keplinger, and Clinton Keplinger. A funeral service will be held at 1:00 PM on Friday, November 23, 2018 at Bridgewater Church of the Brethren with Pastor Jeffery Carr officiating. Burial will follow at Oak Lawn Cemetery. The family will receive friends on Wednesday, November 21, 2018 from 7:00 to 8:00 PM at the Johnson Funeral Service in Bridgewater. In lieu of flowers, memorial contributions may be made to Bridgewater Church of the Brethren 420 College View Drive Bridgewater, VA 22812. To send flowers or a remembrance gift to the family of Clifton Orval Keplinger, please visit our Tribute Store. Pastor Jeffery Carr officiating. Burial to follow service. "Email Address" would like to share the life celebration of Clifton Orval Keplinger. Click on the "link" to go to share a favorite memory or leave a condolence message for the family.